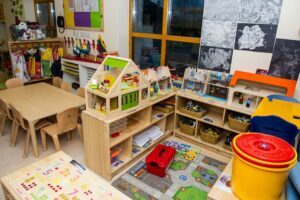 In this blog we will take a look at the importance of creating rich learning environments for children’s learning and development. We will take a look at some of the wonderful environments we have created here at Tigers Childcare. 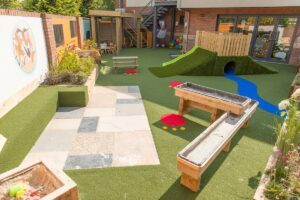 Tigers childcare create rich outdoor spaces that cater for young children’s needs. A haven for physical and sensory exploration. Here at Tigers we understand the importance of outdoor play, we believe that there is no such thing as bad weather, only bad clothing! So often we hear Irish people complaining of our weather! But we know that young children are not afraid of going outdoors in the rain or cold, we know that children love nothing more than putting on their Wellington boots and jumping in muddy puddles! They love bringing out the parachute on a windy day and watching the bumble bees fly on the sunniest of days! Tigers Childcare value rich Indoor environments that are engaging, that stimulate the senses and encourage various types of play and self expression. Did you know that the learning environment should reflect the children’s individual strengths and emerging interests? It should meet their needs and abilities, as well as creating challenges for further learning! The environments are built around the children’s developmental needs. 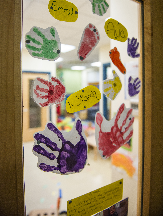 The environments are set up by the educators, who in turn are informed by the children in their care. It is important that we keep in mind the individual children’s needs, the space should allow for small or large group play as well as individual play. A quiet space for relaxation or rest is also essential. Here at Tigers we believe that “play is a way of doing things”, it is a way of learning and mastering skills. Our environments are created to cater for active “hands on” learning. By defining areas of play, we can help children engage in meaningful play experiences. Each area is set up and fully stocked with a variety of different materials which can be used in a number of ways. The children may enjoy a wide range of play experiences from games with rules, to pretend play. The environments are set up to cater for constructive play, to small world play, music and movement to the creative play such as art and crafts. Our environments should reflect the children who attend Tigers Childcare. Their photographs are displayed ensuring they are represented within the environment. From the food we serve, to the language we speak, to the family photos on the wall. We want all children to feel a sense of belonging here at Tigers Childcare. You might notice as you walk around our early year’s centres, the children’s photos and artwork are displayed proudly for all to see. As you walk around our early years centres, you can gain a real sense of what happens on a daily basis! Evidence of messy play and arts and craft projects happening! Information about our fundraising events and fun days are displayed, photos of people in the community who have come to visit us here at Tigers are documented and displayed. All of these special moments are captured in action! Please contact info@tigerschildcare.com if you would like to speak to a member of staff about joining one of our Early Years Centres. 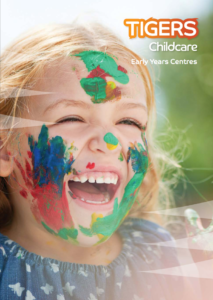 We have 5 early years centres, located in Swords, Balgriffin, Ashbourne, Blanchardstown and Leopardstown.